Try out Some Free Games Today! 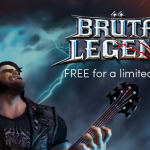 Follow instruction to get the FREE Brutal Legend PC Game Download! – To do this, simply click the add to cart button. FREE Bowling For Kids at AMF ALL Summer Long! At AMF, Summer is for fun – especially for kids! You have to register your kids (ages 15 and under) for the Summer Games and let them enjoy 3 free games every weekday, all summer long! Don’t miss this great offer! FREE San Diego Padres Home Games Tickets – First click on tickets and then select a date and enter coupon code ROCK at checkout. Offer available to the first 10,000 people. Please Note: This may not work on all dates!